Brush the onion with a little canola oil. Preheat a stove top grill pan and cook the onion about 3 minutes on each side. Remove and set aside. Next grill the steaks about 5 minutes on each side, undisturbed. Transfer the steaks to a cutting board and cover with aluminum foil. Allow to rest for 5 minutes before slicing. It’s important to slice against the grain, the steak will be juicier and much more tender. Mix the salad greens and tomatoes with the dressing. Arrange on serving plates. 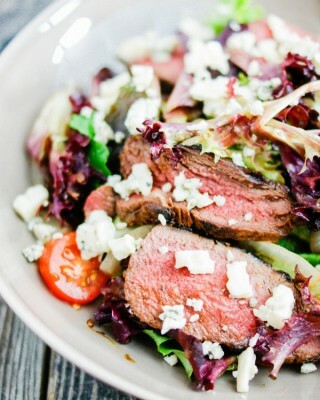 Top with grilled onions, sliced steak pieces and blue cheese crumbles. If you can’t find Wasabiyaki marinade, then make a soy based marinade by combining soy sauce, Worcestershire sauce, minced garlic, black pepper and olive oil.